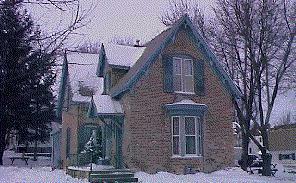 This Gothic Revival style home, one of the few of its type in Cedar Falls, was built by Fitzroy Sessions in 1867. Mr. Sessions was known as a very patriotic citizen, who served his country in capacities ranging from a civil war soldier to the military position of judge advocate of court marshal. He was commended for his bravery and valor, specifically for in the battle of Shiloh. He died in 1908. This house was also occupied by Roger Leavitt, who rented the home when he first came to Cedar Falls.